How to choose my Hairdressing combs? Our range of hairdressing combs are both affordable and of the highest quality - ideal for professional or home usage and doubles up as a great gift. We stock specialist brands such as Kent and Mason Pearson, guarenteed to be exactly what you need. Be sure to check out our range of hairdressing scissors. 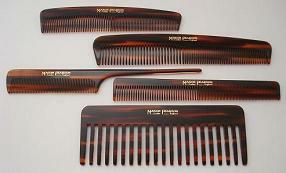 These top quality saw-cut hand-finished vulcanite professional combs are beautifully smooth in use. 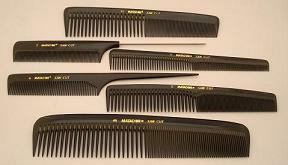 Save 10% off 12 or more combs. Click here to see our available range. Mason Pearson combs are made by hand, using traditional techniques for smoothly tapered teeth and rounded tips. Click here to browse our wares. 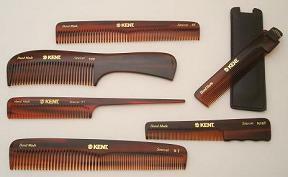 Kent combs are made by hand, cut from large sheets of cellulose acetate with saw-cut teeth, producing a truly gentle comb. Click here to see what sizes and types they are available in. 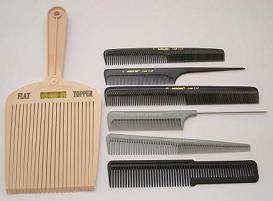 A range of specialist hairdressing combs such as flat top combs, afro combs, pin tail combs and other cutting combs.